This entry was posted in Opinion on September 26, 2016 by Ashley Pearce. As one of the 500,000 people who has taken out one of the Governments fabled help to buy ISA’s only to learn this week they are not exactly what they seemed it got me thinking of the many other news buried Government policies that are affecting people. If you are a disadvantaged young person you are now less likely to attend University, the first time in a generation this fell after grants were cut. But don’t worry student fees for everyone can now be charged at £9250 a year and you will pay interest on this after the student loan book was privatised. You can then go to work where to get there your rail fare has gone up more than your wages despite payouts to rail company shareholders rising. You will be lectured by the Government to save only to receive no interest on any savings or be lied to about a help to buy ISA. The size of initial house deposits in Reading are around £30,000 but don’t worry, second home ownership is soaring under this Government and £9.5bn a year is going straight from taxpayers pockets to landlords pockets. Whoever wins the Labour leadership contest, this country needs a united opposition who will shine a light on these damaging policies and fight for a fairer country. This entry was posted in Opinion on August 23, 2016 by Ashley Pearce. This entry was posted in Opinion on May 31, 2016 by Ashley Pearce. Reading Council recently received an ill timed and poorly delivered letter from Ofsted about the performance of Free school meals pupils in the area. This was seized upon gladly by Reading East MP Rob Wilson. Let’s be clear, we have a lot to do still in education. The Council’s recently set up school led improvement strategy has a clear plan to help this and targets our schools to be in the top 25% of schools within a couple of years. Some things need to be set straight however. The data quoted is from one year in isolation. Not a trend. It was also a pattern across the South East as the Government had yet again changed GCSE grades and curriculums. The two secondary schools that the local authority has direct control over either saw an increase in free school meal attainment or it stayed at the same level. The fact is this Government has been attacking education ever since they were elected. As a teacher and Councillor I am in a fairly unique position but little angers me more than politicians attacking our students and our teachers. If you want to help Mr Wilson rather than criticise, here is some advice. Don’t vote to cut teachers pay, don’t vote to cut schools budgets, stop meddling in costly academisation, leave our curriculum alone and most importantly back our teachers and students. This entry was posted in Opinion on April 19, 2016 by Ashley Pearce. 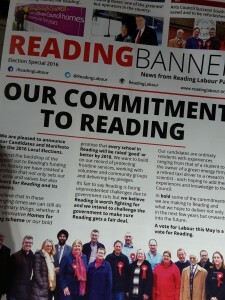 The latest edition of the Labour Party Reading Banner wikl be arriving through your letter box soon. 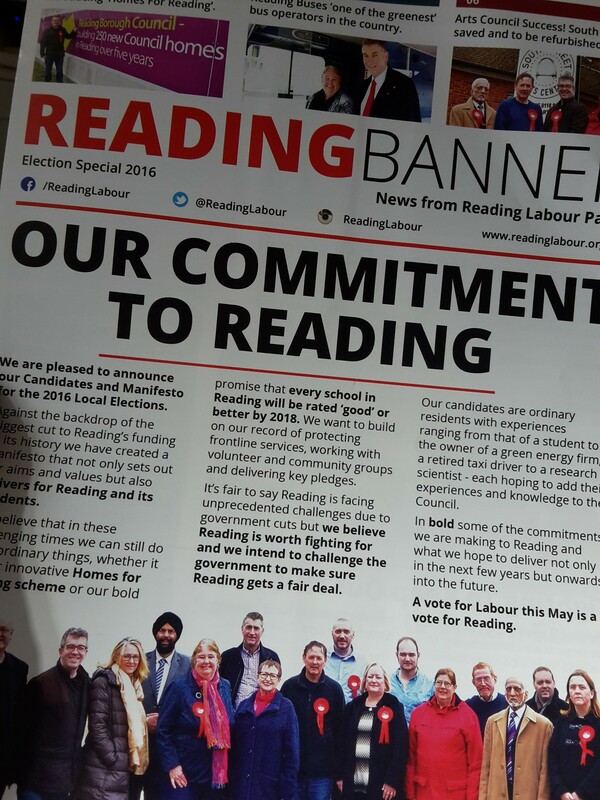 The special election edition includes aspects of Labour’s local election manifesto where as usual we will be fighting for the residents of Reading. This entry was posted in Opinion on April 8, 2016 by Ashley Pearce. George Osborne inflicted another Conservative budget on the country this week that slashes funding, hits the poorest hardest and increases inequality. On top of all of the cuts Reading Council has already had to find, more is set to come after Osborne says a further £3.5bn of cuts are needed. What for you might ask? This Government have borrowed more than any previous Government and all we are promised is more slashing. All pain and no gain. Our NHS is being starved of funding, school budgets are squeezed and this week they want to take £30 a week from disability allowance. With all this pain you would think national debt is falling. It isn’t. It is still rising. With inflation at zero and interest rates at near zero this would be an ideal time to invest in our countries future, building hospitals, improving schools and updating transport. But no. Investment is falling also. Debt is up, wages are stagnant, our future is now more uncertain than ever thanks to Osborne’s lack of vision for a future where we all benefit and not just the super rich. This entry was posted in Opinion on March 17, 2016 by Ashley Pearce. On Tuesday at Reading’s Full Council meeting the Labour and Conservative Councillors voted through a budget that meant cuts to Council services and a rise in Council tax for Reading residents. This is not a decision taken lightly. I have lived in Reading all of my life and these cuts will hit people I know and care for. The Council tax rise will also mean an increase in what residents have to pay in Council tax by about £2-3 a week on average. This increase still does not fully plug the massive funding cut that George Osborne and central Government inflicted upon Reading. It does mean we can still educate our children, we can still care for our elderly and disabled, and we can still collect your bins. The Council is evolving and changing to cope with these cuts but some things will not be possible and for many we know this will be tough. The Council and Councillors will continue to work with and consult with residents on any changes that are occurring. And unlike the Reading MP’s we will fight for Reading residents. Whilst Rob Wilson may not think you are worth fighting for extra funding for, we do. Cuts in Council services and a rise in Council tax may not mean much to a man who is able to claim £177,000 in expenses and who is enjoying an 11% pay rise this year. But most of us do not have that luxury and would urge the Tory MP’s to lobby their Government to stop the unfair treatment of Reading. This entry was posted in Opinion on February 23, 2016 by Ashley Pearce. This entry was posted in Opinion on December 11, 2015 by Ashley Pearce. This entry was posted in Opinion on August 17, 2015 by Ashley Pearce. Despite the bluster in George Osborne’s Summer budget, he once again failed to realise the issues of families across Reading. £12bn in welfare cuts will see working age benefits (tax credits and child benefit included) cut in real terms, the public sector will see pay rises capped at 1% (compared to 11% for our MP’s), maintenance grants for poorer students to attend University have been scrapped and 18-21 year olds have been hit with draconian measures on housing benefit. The Chancellor did manage to find money to cut corporation tax for big businesses, but not business rates for small firms. For Reading, the issues of high housing costs were ignored. There were no plans for a desperately needed house building programme or to deal with sky high private rents but subsidies for social housing are to be phased out. Reading Borough Council will see further unfair cuts to its budget, with funding per head cut by £103 in Reading compared to £38 per head in Wokingham. The Council will have to deliver vital services such as social care and educational improvement, with less and less money. The Government say they are helping families, whilst taking money away from them in tax credits. As usual with this Chancellor, the rhetoric was somewhat different to the reality. This entry was posted in Opinion on July 10, 2015 by Ashley Pearce. This entry was posted in Opinion on June 1, 2015 by Ashley Pearce. Councillor Pearce is a secondary school teachers as well as a Councillor and here are some of his views on education (some serious some not so serious). This entry was posted in Opinion and tagged labour teachers on April 29, 2015 by Ashley Pearce. This entry was posted in Opinion on March 27, 2015 by Ashley Pearce. This entry was posted in Opinion on February 13, 2015 by Ashley Pearce. This entry was posted in Opinion and tagged Church Ward newsletter on October 13, 2014 by Ashley Pearce. This entry was posted in Opinion and tagged Church Ward newsletter on September 3, 2014 by Ashley Pearce. This entry was posted in Opinion on July 10, 2014 by Ashley Pearce.